Description: Three rows of brilliant sparkling C.Z. 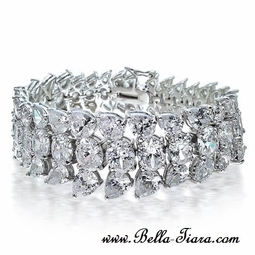 crystals make up this gorgeous bracelet's fashionable style. Two external strands of pear-shaped crystals flank the central row of oval-shaped C.Z. crystals. The crystals are smallest at the ends graduating to a larger size at the center. A perfectly sparkling accessory great for any outfit in need of an elegant accessory. Bracelet measures 7" in length with a clasp. Widest point of bracelet measures 1"